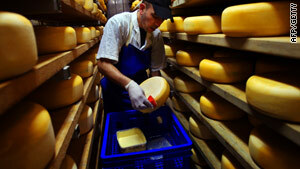 Gouda cheese, similar to the type used in the experiment that proved it helped boost the immune system of the elderly. London, England (CNN) -- Eating cheese boosts the immune system of older people, according to a new study by scientists in Finland. Researchers found that cheese can act as a carrier for probiotic bacteria, widely regarded as beneficial to immune health. Scientists at the University of Turku in Finland discovered that probiotic cheese can tackle the age-related deterioration of the immune system known as immunosenescene. This can leave elderly people more vulnerable to infection and disease because it is harder for the body to kill cancerous cells and reduces the immune response to vaccinations and infections. Infectious diseases, chronic inflammation disorders and cancer are hallmarks of immunosenescene. Dr. Fandi Ibrahim, lead author of the study published in the medical journal FEMS Immunology & Medical Microbiology, said: "The increase in the proportion of aged individuals in modern society makes finding innovative ways to thwart the deterioration of the immune system a priority. "The intake of probiotic bacteria has been reported to enhance the immune response through other products [such as yogurt and certain milks] and now we have discovered that cheese can be a carrier of the same bacteria." Nigel White, Secretary of the British Cheese Board, an umbrella organization representing cheesemakers, told CNN: "These [probiotic] cheeses have not gone down too well in the UK. They are more expensive and there wasn't sufficient scientific evidence on their benefits. The jury was out on their health claims... but this study does look very promising." The team asked volunteers aged between 72 and 103, all of whom lived in the same care home, to eat either one slice of probiotic Gouda cheese or a slice of placebo cheese with their breakfast for four weeks. The fact that all the volunteers were living in the same building helped to reduce any differences caused by variations in diet and other environmental factors, the study said. Both the Gouda cheeses used in the experiment were commercially available, said the scientists. The probiotic Gouda cheese was rich in the bacteria Lactobacillus rhamnosus HN001 and Lactobacillus acidophilus NCFM. Probiotics are microorganisms -- in most cases bacteria -- that are similar to beneficial bacteria found in the human gut. Blood tests were carried out to discover the effects of the probiotic bacteria contained within the cheese on the immune system. Ibrahim said the results revealed a clear enhancement of natural and acquired immunity. "The aim of our study was to see if specific probiotic bacteria in cheese would have immune enhancing effects on healthy older individuals," said Ibrahim. "We have demonstrated that the regular intake of probiotic cheese can help to boost the immune system and that including it in a regular diet may help to improve an elderly person's immune response to external challenges."